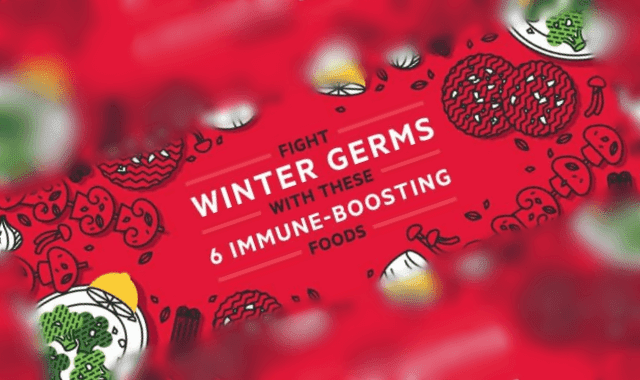 Fight Winter Germs with These 6 Immune-Boosting Foods #Infographic ~ Visualistan '+g+"
While winter brings the holidays, cozy sweaters (at least in some parts of the country), and plenty of comfort food, it can also wreak havoc on our immune systems. But by eating plenty of immune-boosting foods—like sweet potatoes and yogurt—you can help safeguard yourself from a weakened immune system. Germs and illness can not only bring down workplace morale, but also productivity. While a healthy breakfast here and there won’t necessarily triple your productivity, regular healthy meals with these immune-boosting foods can help stave off sickness and keep you on top of your game. Read on to learn how the following six foods can boost immunity plus easy, healthy snack ideas to help you eat more of them.